Enjoy cute, funny exam SMS for girlfriend, boyfriend in Hindi and English. Get all the best exam SMS for her, him and friends to motivate them. If you want to wish your near one, dear one or love one for exams then we have a latest and new exam SMS collection to share. Last minute revision helps you to recall everything and gives you the confidence to do your best. Before your exams don’t be stressed, have a sound sleep ,eat your favorite food, do what makes you feel best. Good luck. Don’t think about exams it's better to think about the great party you’ll have after the result. When exams are near topics are not clear When question paper appears ,all the answers disappear but my dear don’t fear. Good luck. If you believe in yourself and have confidence about your hard work no one can stop you from being successful. Your hard work, determination, being focused and discipline will help you to achieve higher goals in your life. Good luck. Hard work always helps you to reach the higher goals you set in your life.All the best. In exams don’t believe your luck, one who can give you the best result is your hard work. Good luck. Good luck ! I pray the God only those question come in which you have learned. Exams are near, why to fear? God is there, we will clear. Do your best, forget the stress, all the best. Respected teacher, make easy paper otherwise, we will be called dropper. 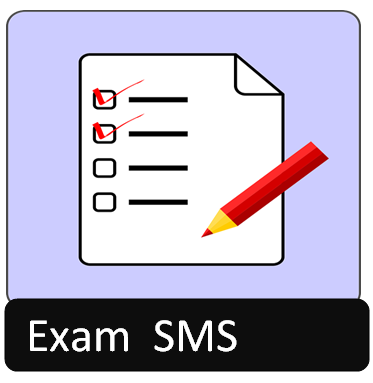 If you are looking for Hindi all the best exam SMS then we have a cute and cool collection of SMS for the exam. Enjoy and share it with your friends to motivate them to do well in exams. पर मार से कौन बचाएगा तुझे निक्कम्मे? We have just covered cute, best exam SMS for boys and girls in Hindi and English. Any of your friends going to appear for exams, then share these messages with them. If you liked our content then share or like us on Facebook or tweet for us. It will motivate our team to write more innovative SMS.